Today, Google hit the stage for a live streamed event showing off a new line of Google products, including two new additions to the Pixel lineup. The Pixel Slate and Pixel 3 were the headlines, but one of the new features of the Pixel 3 may have stolen the show. 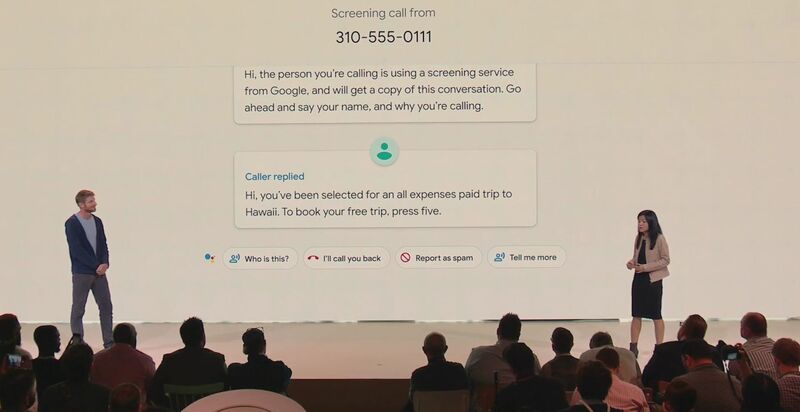 The new Call Screening feature, which will debut with the Pixel 3 and become available on other Pixel devices at a later date, allows users to answer a potential spam call with an AI voice and decide what to do next based on a live transcription of the phone call. This new feature is powered by Google Duplex, the controversial AI platform that is being used to handle customer service in call centers. Google stated that Duplex won't be taking call center jobs away, but it does look like it will be taking away some stress. When users receive a phone call from an unknown number, they can hit the call screening option and an AI powered by Duplex will answer the phone, let the caller know that they're speaking to an AI, and inquire about the call. These details will be relayed on the Pixel 3's screen and you'll be given a handful of options for the AI to relay back. You can report as spam, request more information, tell the caller you'll call them back, or ask who the caller is, all without picking up your phone. It will be interesting to see how the Duplex platform is used across other Google products in the future. Stay tuned to Shacknews for additional updates. I want to be able to point telemarketers at an Eliza program without telling them it's a program. I would totally use this. Hopefully doesn't take long to reach older Pixel phones.